Oh the apple galette is a gallant pie. This rustic French tart exposes just enough of the apples so caramelize, while the crust bakes to a golden, buttery crisp. Apple season is upon us so get rolling. Look for a mix of apple varieties, blending softer sorts that will fall apart as they cook with those that hold their shapes. Balance very sweet apples with tart, mouth puckering fruit for depth of flavors, too. Dan Bussey, Seed Savers Orchard Manager, (and Pommologist, or apple geek), is rediscovering heritage apples, caring for the heritage orchard that now sports over 550 apples varieties. He's devoted his career to reintroducing the most interesting and delicious varieties and helping to make them available to us cooks. Swing by Mill City Farmers Market, October 10 around 10:00 am for a sampling of these new old apples and a celebration of pies! Meanwhile, check out the apples coming in to market, like Summer Gold, Bonnie's Best (Sweetland Orchard), chestnut crab (a lovely, tiny sweet crabapple), Connell Red, Harlson (my personal favorite). Preheat the oven to 425 degrees F. whisk together the cinnamon, allspice, salt and ¼ cup sugar. Add the apples and gently toss, taste and add more sugar if necessary. Roll 1 piece of dough on a lightly floured surface with a floured rolling pin into a 12 to 13-inch round. Fit this into a 9-inch pie plate. Trim the edges leaving a slight overhang. Turn the filling into the shell. Roll out the remaining piece of dough on the floured surface with the floured rolling pin. Cover the pie with the second dough round and trim, leaving a generous overhang. Press the edges of the dough together, then crimp. Sprinkle the piecrust with a little more sugar and cut three steam vents into the top of the dough. Put the pie on a baking sheet and bake for about 20 minutes Reduce the temperature to 350 degrees F. and continue baking until the crust is golden and the filling is bubbling, about 45 to 50 minutes more. Remove and cool the pie on a rack before serving. Preheat the oven to 425 degrees F. Line a large baking sheet with parchment paper. On a lightly floured work surface, with a lightly floured rolling pin, roll out the dough to a 16-inch round. Carefully transfer to the prepared baking sheet. Mound the apple slices over the dough and fold the edges of the dough over the filling, partially covering he apples, pleating the dough as necessary. Dot the apples with butter. 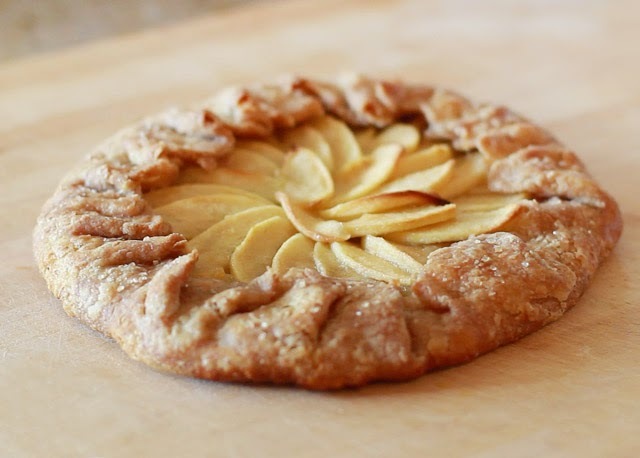 Bake the galette until the pastry is golden and the apples are tender, about 40 to 45 minutes. While the gallette is baking, put the jelly and Calvados into a small saucepan and bring to a simmer over medium heat, stirring, for about 1 minute. Remove the baked gallette from the oven, brush with the melted jelly. Serve warm or at room temperature topped with Calvados Whipped Cream. In a medium bowl, whip together the honey and cream until the cream holds stiff peaks. Beat in the Calvados or brandy. Blend together the flour and salt. Using your finger tips or a pastry blender (or in a food processor, fitted with a steel blade) cut the butter into the mixture until it resembles a lumpy meal. Drizzle in the ice water while gently tossing with a fork (or pulse into the food processor), until the water is incorporated. Using your hands, gather the dough into a ball. Turn it onto a work surface and divide in half. Lightly flour your hands and a work surface and flatten the dough into a 5-inch disk. Wrap each disk and refrigerate until fir, at least 1 hour or overnight. To make the Base: In a food processor fitted with a steel blade, pulse together the butter, flour, brown sugar and salt. Turn into an ungreased 13 x 9-inch baking pan and press evenly onto the bottom with a spatula or lightly floured hands. Bake the base until golden, about 20 minutes. Remove. To make the topping: In a heavy bottomed medium saucepan, melt together the butter, brown sugar and honey over medium-low heat. Bring to a simmer and stirring occasionally, cook for about 1 minute. Stir in the walnuts. Spread the apples over the base, then spoon the topping over the apples, spreading it evenly. Return the bars to the oven and bake until bubbly, about 20 minutes. Cool completely before cutting into squares.